So this past weekend we went to go for a ride at Chocolate World and did a little coaster spotting and looking at some of the upcoming changes at the park as well. We came in behind the park from the west, so our first view of the park came with a look at Great Bear. I love the way this coaster weaves through the terrain. It really is a marvel how B&M was able to make this ride work in such a cramped space. My favorite steelie at the park is Storm Runner. Similar to Great Bear, this is a unique ride, with nothing else out there that is quite like it, thanks to the park being resourceful with its limited space. There is also a lot of work happening in the monorail track relocation project. 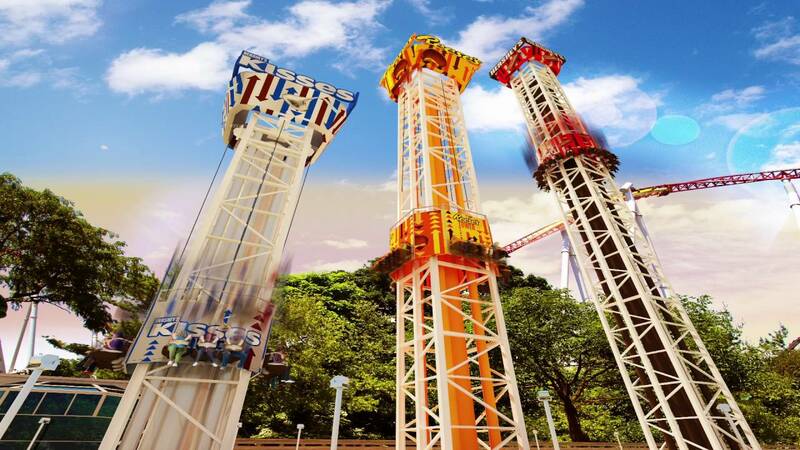 This year's new project for the park is a set of three S&S drop towers, aptly named Triple Tower, with rides of varying intensity that riders of all ages can enjoy. Towers ranging in height, 80 feet, 131 feet, and 189 feet, will thrill riders of all ages. It replaces the Flying Falcon Huss Condor that is said to be in storage and rumored to be resurrected somewhere else in the park someday, similar to the way Starship America was taken out and then put into Founder's Circle. This project is reminiscent of past projects where the park placed family rides near the thrill rides, so that the whole family is able to enjoy rides around the same time, as opposed to having a full section of kids rides that is largely separated from the thrill rides. Renderings of the ride. I am impressed with the concept of having an attraction that the whole family is able to enjoy at different levels. This should prove to be a popular attraction. Continuing our circle around the park, we see the large plot of land that is opened up with the new bridge and realignment of Park Boulevard. There definitely appears to be some earth moving occurring, hopefully in plans for eventual park expansion on the site of the old golf course. Here you can see the changing skyline with the new drop towers. This will be a nice looking part of the skyline once it is complete. Now for our main purpose in visiting, going to Chocolate World to do some riding! The updates over the last few years have transformed this visitor center. The queue is now home to a photo booth thing that your group has to stop and have their photo taken, and at the end they physically hand you a booklet with your photos in the slots of the booklet that costs thirty dollars to take along with you. The ride is still free though. The ride is largely similar to the way it was before, but with more projections as opposed to physical displays. Many of the displays, such as the large chocolate conching machines, sit idle. The latest changes make the ride appear more like a demonstration than an actual production process. The previous plans said that new ride vehicles were coming, but it still has the old Arrow cars. I am not complaining because I really like the older cars. And we leave off with a view of Wildcat! Both this and Lightning Racer were getting their annual maintenance with sections of retracking. I greatly appreciate the meticulous care and love that Hershey's maintenance staff gives to the park's wooden roller coasters. I am curious to see what the skyline will look like once the Triple Tower attraction is complete. It looks like it will be a real winner for the families that visit the park. I also look forward to seeing what will eventually happen with the area of the old Park Boulevard and golf course areas as well. Look forward to seeing some changes and possible expansion there in coming years.